The Chinese Fringe Tree, masses of snow white flowers during June and July. Makes a very special large shrub. Best in full sun. 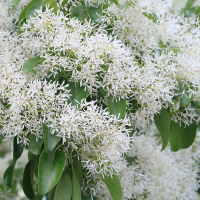 The North American form of the 'Fringe Tree' makes a large shrub with fragrant white flowers. It differs from its Chinese cousin by having larger leaves - introduced in about 1736.